Now that the field has been set for NASCAR’s playoffs in the Monster Energy NASCAR Cup Series, the 16 drivers, along with fans and media alike, are already talking about the fifth event in the 10-race set – Talladega Superspeedway’s 1000Bulbs.com 500 on Sunday, Oct. 14. Known as the “wildcard” event, the 1000Bulbs.com 500 is the second race (of three) in the Round of 12 for the Monster Energy NASCAR Cup Series Playoffs. When NASCAR’s premier series invades the mammoth 2.66-mile, unpredictable venue, there will be 12 drivers still eligible for the title, and a victory by any of those competitors, will mean an automatic berth into the Round of 8. Brad Keselowski is the 1000Bulbs.com 500 defending champion. In addition to the 1000Bulbs.com 500, playoff action will swing into high gear on Saturday, Oct. 13, for the Talladega 250, for the NASCAR Camping World Truck Series. Along with the on-track action, the weekend’s events include a variety of activities for families and for those fans with a hefty dose of friendly but intense competition. 1000Bulbs.com Lighting Contest – Fans who choose to camp on the grounds of the Talladega Superspeedway are eligible to participate in the 1st annual #GETLIT contest. Judges will be searching for the best party lights on an RV or at a campsite on Saturday evening. Fans can win in one of two categories: Best Creative Lighting or Best Use of Christmas Lights. On Sunday morning, the two winners will be announced and receive a “Super Bulb” trophy, $500 gift card to 1000Bulbs.com, and of course, bragging rights. Friday is FREE – The weekend begins early for fans at 4 p.m. CDT as the grandstands will be open to public on Friday, Oct. 12. Fans can watch the time trials free of charge and find out what the starting lineup will be for the NASCAR Camping World Truck Series Talladega 250 on Saturday. The Big One on the Blvd – On Friday night at 7 p.m., all Renewal Guest ticket holders, infield camping guests, and fans that purchase an infield wristband can enjoy the "Big One on the Blvd." The NASCAR party of the year begins with a parade of the sport’s biggest stars down the infamous Talladega Blvd. on a Mardi-Gras style float before overseeing fan competitions. Every year, the Big One on the Blvd invites fans to participate in challenges with cash prizes and pride on the line. The all-new lineup of fan challenges for the party include Miso Hangry, Rubber Pull, Hungry Hippos, and Dirty Girl Deluxe Wash. Kids Movie Night Returns – After the Talladega 250 and the Foodland/Food Giant Qualifying for the Monster Energy NASCAR Cup Series on Saturday, families can stay for the free Kids Movie Night. Children can watch a feature-length film on a giant screen in the FOX Sports 1 Dome just outside the track. There will also be games, prizes, face painting, and a few superheroes appearances as well as a Kids Autograph Session with their favorite drivers before the movie. A free Saturday ticket or a Sunday child’s ticket is required for entry and doors open at 5:30 p.m. Kids VIP Experience – Presented by Children’s of Alabama, this event provides an opportunity for children 12 and younger to get an exciting behind-the-scenes look and up-close access on race morning for the 1000Bulbs.com 500. Youth with a Pre-Race Pit Pass upgrade can sign up for their choice of an array of VIP opportunities like Hot Laps around the track and fist bumps during the Driver Introductions. Saturday Night Infield Concert – While the kids enjoy a movie and games in the FS1 Dome, adults can head over to Talladega’s iconic infield for the Saturday Night Infield Concert presented by Wind Creek Casino and Hotel. The traditional concert, featuring country music artist Chris Janson, is scheduled to start at 7 p.m. Anyone who has a ticket to the 1000Bulbs.com 500 gains admission into the concert. Before and after the pivotal Talladega 250 scheduled for a 12 p.m. CDT start, Saturday’s on-track action will see practice for the 1000Bulbs.com 500 at 10:05 am, and the Foodland/Food Giant qualifying at 3:35 pm to determine the starting lineup for Sunday’s anticipated event. This will be the final event weekend before the track begins construction on Transformation – the Talladega Superspeedway Infield Project, which is set to be fully completed in fall of 2019. As part of the track’s upcoming 50th anniversary, Transformation is an approximately $50 million infield redevelopment venture to enhance amenities for fans, sponsors, teams, and stakeholders alike. Renovations include expansions to premium RV camping spots, a highly-anticipated interactive Garage Fan Zone Experience and new large tunnel that will provide 24-hour entry into the infield. Phase I of the TSS Transformation 2019 will begin immediately following the conclusion of the 1000Bulbs.com 500. There are a variety of ticket and pit pass options for the 1000Bulbs.com 500, including programs honoring teachers and educators, along with military personnel and first responders. For information about tickets and campsites for purchase, contact www.talladegasuperspeedway.com or call 855-518-RACE (7223). 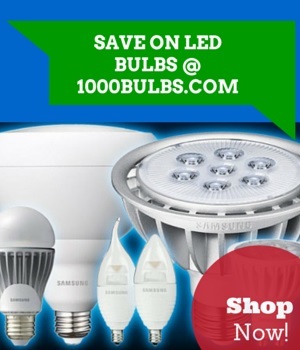 For RV and campsite lighting solutions, visit www.1000bulbs.com or call 1-800-624-4488. Talladega Superspeedway is NASCAR’s Most Competitive (record 88 lead changes in 188 laps), highest banked (33 degrees), and longest track (2.66-miles), as well as the most fun and fan-friendly. Talladega offers something for everyone, including hundreds of acres of free camping, amazing kids’ tickets and college student prices, along with special offers for military members, first responders as well as teachers and educators. The historic venue, built in 1969, features the traditional Saturday Night Concert and the world-renowned Talladega Blvd, home of Friday night’s “Big One on the Blvd” party. It’s the site of the most comfortable seats in motorsports, large ISM Vision HD video boards lining the frontstretch and endless pre-race activities for fans on race day, including special kids’ VIP opportunities. Talladega’s fall 2018 double-header race weekend, featuring the 1000Bulbs.com 500, is set for October 13-14. For more information, go to talladegasuperspeedway.com or call the Talladega Ticket Office at 855-518-RACE (7223).